I made it, with 8 hours to spare. Grandmother's Diamond Ring, designed by Judy Martin, is a finished flimsey. That was my goal for July, so I'm pretty pleased with myself. And to make it even better, I love it!! And now, it goes onto the pile of Mount-To-Be-Quilted. Judy Laquidara, who sponsors the monthly UFO challenge, pulled number 7 for August, which is the Spring Swap quilt that I did a couple of years ago. It is a flimsey, and needs quilting. The challenge will be to fit it into August sometime to get it done. I'm sure, if I manage to get it done, that there will be some continuous curves in the pieced areas, and probably some feathers in the setting triangles around the outer edges. Either that, or it might be fun to do continuous curves in the setting triangles a filler. I'm linking up to Judy's UFO report, where there are a few more people with finishes this month. This is my July UFO, and it is almost finished. Grandmother's Diamond Ring, by Judy Martin, found in her book, The Creative Quilt Pattern Book. The center section is done, and it just needs borders added to it. I'm going to take some of the 2 1/2 inch strips of the leftover 30's fabrics and use them sort of randomly as the borders. I'll put them all up on the wall first, just to make sure there are no overlaps of the same fabric touching. And looking at it now, I think I might put a four patch of 30's fabrics on each corner. I have until midnight tomorrow to get it done in time to have it finished in July. I wonder if I'll make it, considering I have to work tonight. I'm linking to Judy's Design Wall Monday. I managed to get a lot done this past week on Noel's stocking for this coming Christmas. All that is left to do on it is the small toys that are dimensional. These are turning out to be so much fun to do. I'm glad I saw This post of Debbie's where she reveals her Christmas stocking collection. It got my brain working, and inspired to do some of my own. Although there is no way I'll end up with as many as she has. But I should be able to meet my goal of having 4 of them done, plus the ornaments. And then there is the stash report. Not mush use to report this past week, since most of what I'm using has been already counted as cut. But my in numbers have gone up, which was a lot of fun. Balance: 54.75 more yards in than out. And this number is going to go up even more in the next week or so, once an order from Thousands of Bolts comes in. It started out as an order for some backing, and sort of grew from there into an order full of Autumn themed colours. There is a colour that I see every year in farmer's fields, that wonderful gold colour of ripening wheat and hay. I have always wanted to do a quilt using that colour, and I think this may be the year for it. That wonderful gold colour as the background for lots of wonderful leaves. I'll take pics when they come. I'm linking up to Judy Laquidara's Stash report and Kathy's Quilts Slow Sunday Stitching. I have great plans for today. I have a quilt loaded on the machine to play with. Charlene did a scrappy Broken Dishes. Here's a sneak peak. She wanted an over all something, so I decided to do some fn swirls. And I'm hoping to get some more work done on the Grandmother's Diamond Ring quilt, as well. It is coming along quite well, and I would say that it is about halfway done. And tonight, I'm going to a fabric party. The vendor there is going to be the owner of the online store Mad About Patchwork It looks like there is some fun fabrics, and I'm looking forward to seeing what she will be bringing with her. I am anticipating some fabric acquisition to be happening. I'll show you tomorrow what I come home with. And now, I'm going to go and play. I have Grandmother's Diamond Ring, designed by Judy Martin. The pattern is in her book The Creative Pattern Book. This one is going to be up there for quite a while, I think. 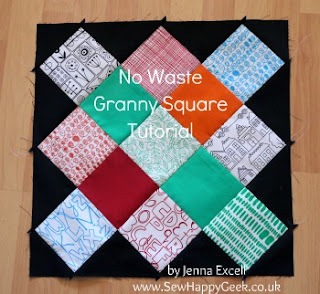 The blocks are all odd shapes, so it doesn't work well for chain piecing, plus it would be very easy to get them mixed up, or turned in the wrong direction. So, I'll be sewing them together slowly, one piece at a time. However, that means there will be a lot off leaders and enders going though, so the Irish Chain quilt that will be built from those will go faster. I sure am liking the way this is looking, so far. This is the first quilt I've ever done with the 1930's reproduction fabrics. They are fun to use, so bright and happy and whimsical. I have lots of them left, so there will be more 1930's quilts in my future. I'm linking up to Judy Laquidara's Design Wall Monday party. There is lots of fun eye candy and inspiration to look at over there. Stash Report Week 30, 2012 and Sunday stitching. There has been progress in both areas..... stash and stitching. I like these Sunday stitching reports. They give another avenue of incentive to get some work done from week to week. We discovered a really, really good TV series this past week, called Downton Abbey. Scott had purchased the first season, and it was so good we watched it in a marathon last Sunday. We finished the last episode at about 8 pm, and Scott got up, and went right out to the store to pick up season 2, which we also ended up watching in another marathon over that same evening and then on Monday. It's amazing the amount of stitching that can be accomplished while watching a full year's worth of a TV series. LOL! There are about 150 pieces in this stocking, and I put #63 on last night, so it is almost halfway done. I think the rest of it is all the little toys. For the stash report, I cut a lot for the July UFO, so there is yardage used. Balance: 47.15 more yards in than out. It is quite possible that my purchased numbers are going to go up this week. I've been invited to a "fabric party", kind of like a quilter's version of a tupperware party, but a whole lot more fun buying fabric rather than plastic. LOL!! I'm linking up to Kathy's Sunday Stitching post. 1 1/2 strips to add to that particular drawer, as well. That feels so much better!! Now, all I have to do is get back to my UFO, and maybe even get it finished before the end of the month. I have an hour before I have to get ready for work, so I think that's what I'm going to do. Scrappy goodness quilt went home. Way back in April, Charlene brought me 3 quilts to do, and then said she was not in any hurry for them. I took her literally, and have been doing other quilts that people were in a hurry for. But, it has been long enough, and I've decided it is time to get them done before they grow roots and become permanent fixtures in my sewing room. And I'm starting to feel guilty that I've had them this long, even though she did say not to hurry.This quilt is full of wonderful scrappy goodness. It makes me happy just looking at it. I really had no clear idea of what I was going to do on it. Charlene's guidelines were "something simple, like a meander, or something". I'm not a big fan of doing the basic puzzle meander. It is too over worked and done way too often. Once I had this quilt loaded, it told me what it wanted. It said it wanted to have loops going into each individual square, so that's what I did. Jannette came over to play on Tuesday afternoon. We had such a great time chatting and visiting, and sewing. It has been so very long since I have had company to sew with. At least a couple of years, if not longer. I am hoping we can do it again, soon. I pulled out my UFO for July, which happened to be another Judy Martin pattern. It is from her book The Creative Pattern Book and is called Grandmother's Diamond Ring. It is quite a challenge. I already had all the coloured diamonds and triangle units pieced, so I am now adding them to the background shapes. I have found, however, that I wasn't to terribly accurate in my piecing when I was sewing them together, so some of them are going to be a bit wonky. Hopefully, once it is all sewn together, it won't end up too distorted. But I must confess that there is a lot of fudging going on. It is actually going fairly quickly, even with the fudge factor, so I'm hoping to have most of it pieced together by the time I go back to work on the weekend. And our new front door came today, and was installed by a couple of really nice young men, who were quite good at what they were doing. As far as I can tell, that is. Now we won't need to hang a quilt over the door to keep out the wind next winter and we don't have to hold the screen part of the screen door in place with duct tape. The quilter in me really likes the way the curves on the top of the screen door pick up the curve of the little window in the door. All in all, a couple of really good days. I finally have a change to what is on my wall. My Heartland Star, designed by Judy Martin is a finished top. When I first got her new book, Patchwork Among Friends, this was the quilt that caught my eye the most. This one measures 86x86 and I could barely get all of it into the picture. I already know how I'm going to quilt this one, and have it already scheduled in to be done. Here's a pic of the quilt straight on. I love the circle of small stars a around the big center star. And here's a close up of the center lone star variation. I simply LOVE this quilt. And it is fun to look at it and remember that I bought the fabric on my first meeting with Jannette, a fellow blogger. We had a great time that day, and got on quite well. So well, in fact, that she's coming over tomorrow afternoon for a sew in. Hmmmmm, I guess that means I'd better do something about clearing off some of the table surfaces up in my sewing room, or she'll not have anywhere to set up. LOL!! I'm linking up, as usual, to Judy Laquidara's Patchwork Times for her design wall Monday get together. I'm joining in with a fairly new linky party hosted by Kathy. This is the 4th week, and it shows what different hand projects we are working on. So I thought this would be a good opportunity to show the progress week by week on the Christmas stockings I'm doing for our adult children. While we were away in Algonquin a week ago, I finished up Rebecca's manger scene stocking. And then there was still time to get a start on Noel's Santa's Workshop stocking. This one is going to be really challenging. It has a lot of 3 dimensional toys on it, which should be a lot of fun to do. I love the way the window looks. Having the linky party each week will give me incentive to work on them, beyond the fact that I want to get all 4 of them done by Christmas. However, when I get to Laurie's, I won't be able to show pictures of it, because she reads my blog, and I don't want to ruin the surprise of it. I have some good stash numbers this week. I finished up a quilt top on my Friday afternoon and night sew-in, so I can count those numbers now. I usually count as I cut, but I forgot to write the numbers down as I was cutting this time, so it is a finished quilt to report this week. I'll put up pictures of it tomorrow. Balance: 51.55 more yards in than out. I'm happy that the used numbers are starting to go up. It gives a good feeling of getting something accomplished. I'm linking up to Judy's Stash report at Patchwork Times. On a sadder note, Scott's brother is back in hospital with a pretty severe case of pneumonia, and he doesn't have a lot of strength left with which to fight it. So, we are waiting to see what happens there, knowing that it is all in God's hands. When we were up in Algonquin last week, we did one of the many hikes that are mapped out there. They are rated according to difficulty, one dot being the easiest, and three the most difficult. When we were camping in this same area six years ago, we did the hike around Peck Lake, and it was a truly gorgeous area. I'd just purchased my first digital camera, and really didn't know what I was doing with it. There were some gorgeous pictures from that hike, but the were all on the smallest setting. I had really wanted to have some of them printed to be able to hang on our walls. So, when we were up there last week, we did the same hike, with the intent of getting more pictures, this time on a setting which could be printed. These two definitely fit the category of being printable. Remember the bit about the difficulty level? This one in rated as two dots, moderate difficulty, taking 1 1/2 hours. When we did it six years ago, it wasn't bad at all, so we thought we knew what we were getting into. Well, all I can say is, what a difference 6 years makes. We came out of this one huffing and puffing, and feeling and looking like we'd been hit by a Mac truck. Of course, it didn't help that the temperature was in the 30's, with a humidex in the 40's. So it wasn't maybe the smartest thing we've ever done. I think we were both in the beginning stages of heat stroke, with faces bright red, slightly dizzy, legs slightly wobbly, and with the beginnings of headaches. We fell into the car, gabbed something cold to drink and turned the air conditioning on full blast. But now, looking at the pictures, I'm glad we did it. But after this one, we decided that we wouldn't attempt any of the others, since it was way too hot and there was a real danger of heat stroke. So we spent almost all the rest of the time relaxing in our campsite, me with a book or with hand stitching, Scott with a book or some games on his computer. Lovely and quiet and relaxing, which, after all, was the purpose of the week in the first place. We are having a wonderful and relaxing time on our vacation. There is a Wi-fi center at the visitor's center. Otherwise, I wouldn't be posting. The wireless internet service in non-existent in the park, and very sketchy out on the main highway. But, in a way, it is nice to get away from even that. This was the sign that greeted us when we got to the park on Tuesday afternoon. And this is our soft sided home for the week. So we are being very careful and are keeping all the food in the car. The last thing we want is a black and furry visitor, looking for food. And this is the view from the beach in our campground at almost sunset last night. We'll be home Monday evening, sometime before dark, and I'll be back in touch then. Our vacation is a go. Woohoo!!! But the problem with the car was a scary one. We had some work done on it a couple of weeks ago. We were told to take it to a certain garage, because the car was covered under an extended warranty we bought when we bought the car. They did the work that needed to be done, after Scott did a whole lot of arguing with the warranty coverage about what we thought we were covered for, verses what the warranty company said we were covered for. That was certainly an eye opening experience, and one we will never repeat. All kinds of fine print, and exceptions to what was and was not covered. Anyway, ever since this garage did the work, there had been very strange rubbing noises coming from the front wheel areas. When Scott took it in this morning to be checked at the dealership, rather than the garage we went to for the original work, the mechanic said that the lug nuts that hold the wheels in place had not been tightened. The wheels were gradually working these nuts loose and would shortly have fallen off!!! So, all is well with the car, and we have decided that we will check in daily with the nursing home where Scott's brother is living, to find out how he is doing. We are on our way to a quiet and relaxing week at Algonquin Park. There will be hikes taken, but only the easy ones, and maybe even a canoe rented for a day or 2. I have my ereader loaded with books, and the Christmas stocking to work on. Hopefully there will be some wireless reception in the area. If not, things will be quiet here on the blog for the next week. I had a big finish this week, therefore I finally has some fabric out to report. Balance: 57.85 more yards in than out.